After passing for nearly 4,000 yards last season, Cal quarterback Jared Goff hopes to lead the Bears back to a bowl game. Every college football season brings a lot of roster turnover. To get you ready for the 2015 campaign, SI.com presents the Off-season Spotlight, a weekly feature on a player whose name you’ll want to know by the fall. Last week, we focused on Florida State freshman safety Derwin James. This week, we shift our attention to Cal junior quarterback Jared Goff. 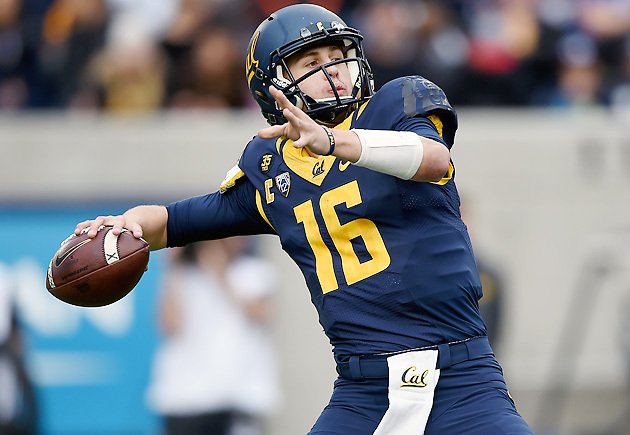 Goff could lead Cal to its best season yet under third-year coach Sonny Dykes. The Golden Bears won only one game in Dykes’ first year at the helm but improved to 5–7 in 2014. This season Goff returns as a third-year starter alongside a strong cast of playmakers that includes wide receivers Kenny Lawler, Bryce Treggs and Stephen Anderson as well as running back Daniel Lasco. Though Cal faces daunting divisional road games against Washington, Oregon and Stanford—the latter two of which ranked 10th and 11th, respectively, in SI.com’s post-spring power rankings—its remaining matchups in the Pac-12 North (Oregon State and Washington State at home) should be manageable. With Goff piloting the offense, even slight improvement on the defensive side of the ball should help Cal earn its first postseason berth since 2011. While college football fans will focus mostly on Goff’s impact on Cal, NFL talent evaluators will be monitoring him closely to assess his potential to develop into a franchise quarterback. Goff, who is highly regarded for his combination of size (6’4”, 210 pounds) and arm strength, is considered one of the best signal-callers in the 2016 draft class and is projected as a first-round pick in some early mocks. What has he already done? After arriving at Cal bearing a four-star grade from recruiting services, Goff was named the Bears’ starter as a true freshman. The Marin Catholic (Calif.) High product’s lack of experience did not prevent Dykes from unleashing his Bear Raid offense in full. Goff set program records for passing attempts (531) and passing yards (3,508) en route to being named All-Pac 12 honorable mention. He was one of the lone bright spots during a season in which the Bears went winless in Pac-12 play and finished 1–11. Goff became more efficient in his second season. Though he attempted 21 fewer passes than he did in 2014, he threw for 465 more yards, tossed three fewer interceptions and increased his completion percentage to 62.1%. Goff’s improvement helped the Bears leap from 12th in the Pac-12 in scoring offense in ’13 to third in ’14, and he nearly led Cal to an upset over South division contender UCLA in October. Though Cal ultimately fell one win shy of bowl eligibility, Goff inspired optimism in what the Bears can accomplish this season. How did he look this spring? We recommend you watch Goff try to carve up defenses this fall, but the clip below should provide an indication of why he’ll enter this season as one of the top quarterbacks in both the Pac 12 and the eyes of NFL scouts.